Welcome to the EFG Kids’ Corner! This is a series of articles written by gamer kids all over the country! If you are a gamer kid (or know one) send me your best stuff in an email at editor@engagedfamilygaming.com! You just might see it here! Without further adieu… here we go! I’ve waited a while to talk about this game because I needed to play it a bit. 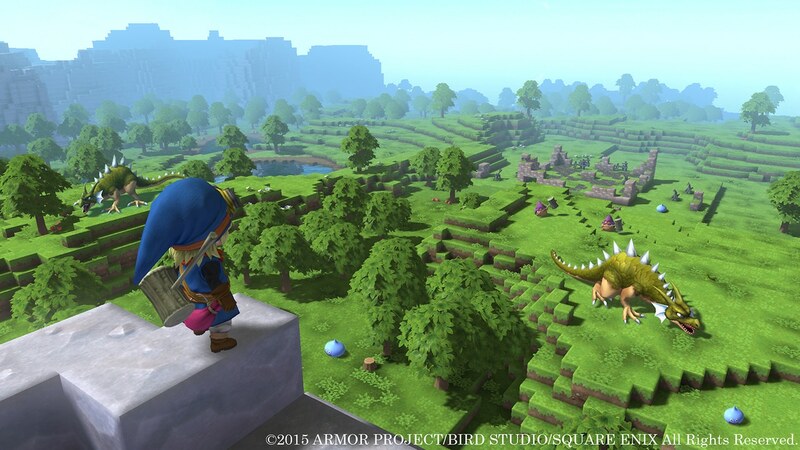 Dragon Quest Builders, a PS4 exclusive, is my favorite game that I have on the PS4. It’s kind of like Minecraft crossed with Clash Of Clans. I like that the main character looks like Link enough so that I think I’m playing Zelda. It’s a great entry to the Dragon Quest series by introducing you to the items and baddies, even though it is very post apocalyptic because you are in a destroyed form of the Dragon Quest world. Now we are onto the story! The main character (you) is woken up by the Goddess in a strange chamber, the tutorial room. The Goddess tells you that you are the only person with the power of building and creating items. After exiting that chamber you see a desolate land inhabited by plants and monsters as well as the remains of a city (See! I told you post-apocalyptic). The Goddess tells you to walk towards the ruins and plant a flag. After you plant the flag a person shows up and asks you to build a house. After you build the house she asks you to find food. After you find both of you food she asks you to build a stone mason’s workshop, basically a house to craft in. After you build that building you are told to find another person. After you find him you have a non-tutorial state of game and you can finally roam and do whatever you want . You play the game by killing monsters and building. Each city in the game is a different level. You complete a level by beating a big boss after completing all the quests in that city. You get materials by breaking blocks and beating monsters and you beat monsters by hitting them with weapons you make. Is this a good game? Yes it is, it’s very fun, and engaging. Should you play it? Yes, you should it’s probably the best Minecraft copy and town builder that is also its own game I have ever played!